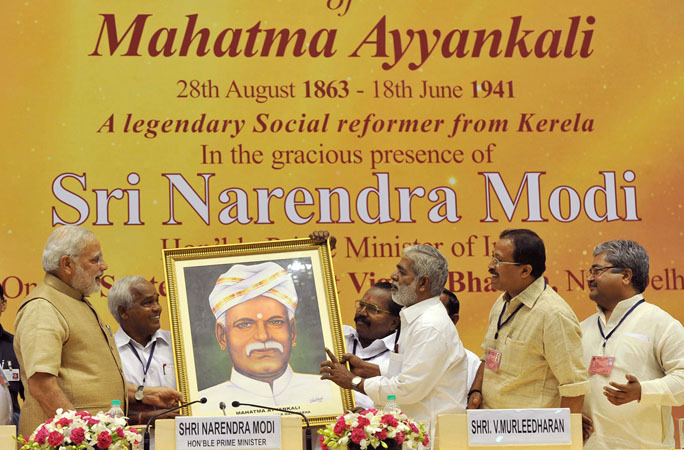 Prime Minister Narendra Modi was invited as honourable guest on the occasion of 1st ever celebration of birth anniversary of Mahatma Ayyankali and also to pay homage to great social reformers like Mahatma Ayyankali and Sri Narayan Guru at Vidhya Bhawan, New Delhi organized by the Kerala Pulayar Maha Sabha (KPMS). PM Shri Narendra Modi declared that India has begun its journey towards social harmony. He said that, “a combination of ‘Samata’ (equality) and ‘Mamata’ (motherly love) would lead to ‘Samarasta’ (social harmony).” He also said and asked everyone present there that, equality has been guaranteed by the Constitution, but can equality alone achieve social harmony. Mahatma Ayyankali was a great legendary social reformer from Kerala born on 28th August 1863 and died on 18th June 1941. He played very important part in cleaning social evils from the society for its betterment and positive growth. He struggled against the social discrimination and fought for the rights of the helpless and cleaned the social evils of the society. He worked really hard. Once he did not have permission to plan his public meetings on land area. He was so passionate and hard working that he planned it on boat with full dedication. The PM Narendra Modi said that due to the social reformers only, our social, religious and cultural heritage is saved from decades or thousands of years. Social reformers did a lot to save the country and its people and cultural from social evils, unnecessary and illegal practices and given hope to every one or the other to move forward. Appreciating the work and moves of Mahatma Ayyankali for social reform, the Prime Minister said,” just as the Dandi March of 1930 was a turning point in our freedom struggle, the Kayal Sammelanam of 1913, organized by Ayyankali two years before the arrival of Gandhiji in India, was a turning point in the history of social reform in India”. We are a group of Indian professionals spread across the globe who consider Shree Narendra Modi to be our role model. Initially we had come together to launch the campaign ModiForPM in order to have Shree Narendra Modi elected as the PM of India because of the extraordinary achievements of Gujarat State under his leadership. We want all the other states in India to be as prosperous as Gujarat..